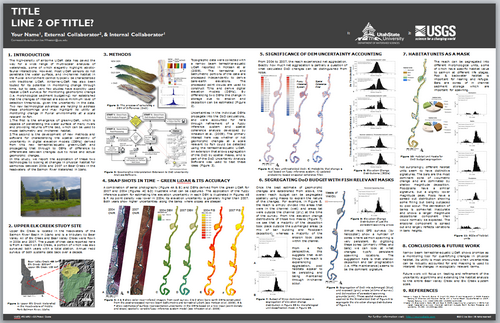 We will hold a poster session during class on April 23rd in the Atrium. You will each prepare your own poster to present during your normal lab time. The poster should be a summary of the key findings from your work and your interpretations. You will unlikely be able to fit everything you did on one poster. The poster should briefly tell a story and present the question/motivation, objectives, study site, methods, results, interpretation, conclusion. Attendance is mandatory to get a passing grade on the project. A sequence of six to ten 8.5 x 11 tiled sheets that comprise the whole poster. Even if you do not print a full size version of your poster, it is recommended that you prepare the posters in something like Adobe Illustrator, Microsoft Publisher or Microsoft PowerPoint on a full size poster sheet (see here if you need help). You should prepare a PDF or image of your poster, so you can host a digital copy on your project page for your website. Highlight the authors' names, e-mails, and address information in case the viewer is interested in contacting you for more information. Also post a PDF (< 10 MB in size) on your project pages for your course website, and submit the URL to Canvas to receive poster credit. We will split the class into two groups. Groups will alternate between standing by their posters and answering questions and wandering between the different posters. You will be responsible for filling out anonymous peer-review forms of others' posters and you will be encouraged to give each other constructive critiques and helpful feedback. You will be graded in part on your participation in this peer-review process.